Eric Todd Reid (born December 10, 1991) is an American football safety for the San Francisco 49ers of the National Football League (NFL). He played college football for Louisiana State University (LSU), and received consensus All-American recognition. He was considered one of the top safety prospects in his class, and was selected by the San Francisco 49ers in the first round of the 2013 NFL Draft. Reid was born to Eric and Sharon Reid in Baton Rouge, Louisiana. He attended Dutchtown High School in Geismar, Louisiana, where he played football, basketball and ran track. In football, he recorded 78 tackles, nine sacks, four interceptions and three fumble recoveries as a junior. As a senior, he received Louisiana Class 5A All-state honors after registering 45 tackles and three interceptions. He played in the 2010 U.S. Army All-American Bowl. Also an standout track & field athlete, Reid followed in his father's footsteps to excel in the hurdling events while at Dutchtown. His father was the 1987 NCAA Champion while at LSU. In sprints, he recorded a PR time of 6.69 seconds in the 55-meter dash at the 2009 LSU High School Indoor Classic. In the hurdling events, he placed 4th in the 55-meter hurdles at the 2009 High School Last Chance Qualifier, with a PR time of 8.00 seconds. He got a career-best time of 14.2 seconds in the 110-meter hurdles at the 2010 Dutchtown 4-way Meet, where he took gold. Reid enrolled in Louisiana State University, where he played for coach Les Miles' LSU Tigers football team from 2010 to 2012. As a freshman in 2010, played in 13 games with three starts. He finished the season with 32 tackles and two interceptions. As a first-year starter as a sophomore in 2011, Reid recorded 76 tackles, two interceptions and two forced fumbles. He was named a second-team All-American by Rivals.com and was a second team All-SEC selection by the Associated Press. As a junior in 2012, he started all 13 games at safety and finished third on the team in tackles with 91 (42 unassisted), two interceptions, and seven pass breakups. He was recognized as a consensus first-team All-American, having received first-team honors from the American Football Coaches Association, Football Writers Association of America, ESPN, and Scout.com, and second-team honors from the Associated Press, Walter Camp Football Foundation, Athlon Sports, CBSsports.com, and Sports Illustrated. He was also a first-team All-SEC selection. The San Francisco 49ers traded up to the 18th overall pick with the Dallas Cowboys to select Reid. He was drafted with the intent to replace former starter, Dashon Goldson, who left via free agency to the Tampa Bay Buccaneers. Reid won the team's starting free safety job over teammate Craig Dahl. In his NFL debut in the Week 1 win against the Green Bay Packers in San Francisco, he recorded his first career interception on a pass thrown by Aaron Rodgers. In the following game against the Seahawks, he recorded another interception. However, in that game, he sustained a concussion. In one of his best games of the year, Reid notched an interception and recovered a fumble against the Arizona Cardinals. Later in the season, against the Carolina Panthers, he was concussed again. However, in his whole rookie season he did not miss a start. He ended his rookie season with 77 tackles, and 4 interceptions. At the end of his terrific rookie season, Reid was elected to the 2014 Pro Bowl. On May 2, 2016, the 49ers picked up the fifth-year option of Reid's contract. He was placed on injured reserve on November 22, 2016. He started the first 10 games on the season and finished with 81 tackles, one interception, four passes defensed and one forced fumble. ↑ "Eric Reid Bio". lsusports.net. February 18, 2013. Retrieved April 26, 2013. ↑ Alper, Josh (April 25, 2013). "49ers trade up to 18th spot to grab Eric Reid". NBCSports.com. Retrieved 2014-06-23. ↑ Price, Taylor (September 8, 2013). "Eric Reid Intercepts Rodgers". 49ers.com. Retrieved 2014-06-23. ↑ Williamson, Bill (January 29, 2014). "Eric Reid treasures Pro Bowl experience". ESPN.com. Retrieved 2014-06-23. ↑ "49ers exercise fifth-year option on safety Eric Reid". ESPN.com. May 2, 2016. Retrieved May 27, 2016. ↑ "49ers Place S Eric Reid on Injured Reserve, Announce Other Roster Moves". 49ers.com. November 22, 2016. 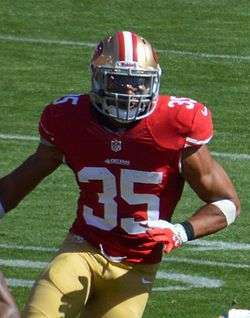 Wikimedia Commons has media related to Eric Reid (American football).